It must be getting on fall… the dogwood started sporting red leaves back in late July, we hear the geese in chevron flying overhead every twilight, and Jeff says the wooly bears started coming out last week (the fuzzies are apparently an ancient harbinger of winter). And the birds are back. After a summer of desolation at the bird feeders, the suet melting in the heat, the millet moldering behind its squirrel proof cage, the birds are swooping in again. Chit chattering all morning through to cocktail hour, fattening up their glossy summer plumage before it’s time to brown down. 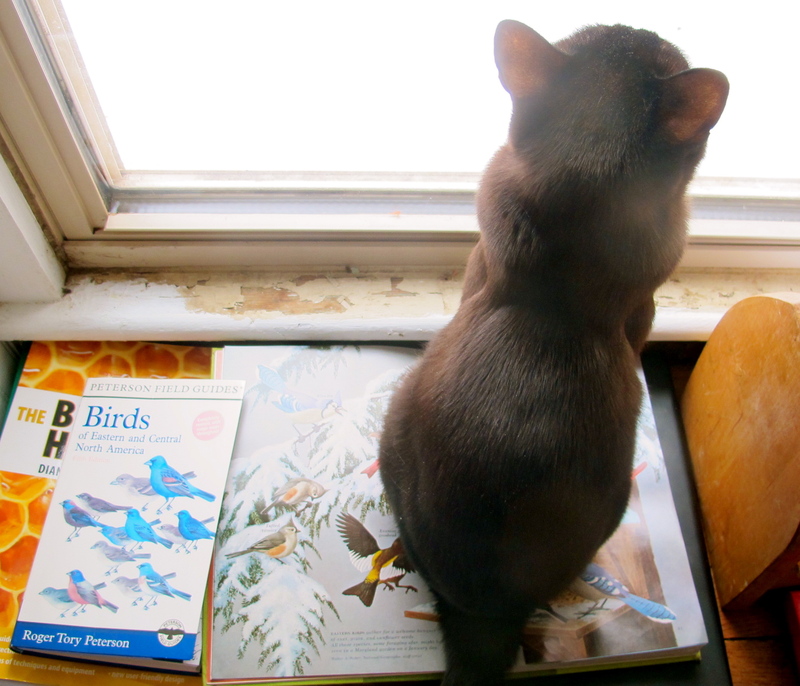 Dr. Russell the Cat Scientist is constantly taking data measurements and consulting his reference tomes watching them at the window, from the catbird seat.